A long line of eager listeners stretches outside a small, dark room at the heart of Sennheiser’s CES booth. 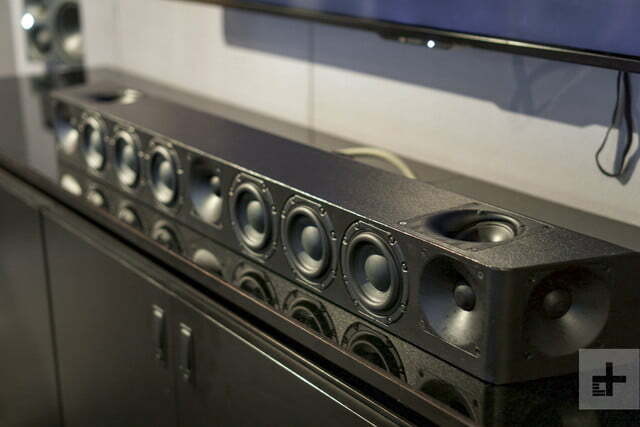 Inside, they will experience the new secret weapon in Sennheiser’s Ambeo arsenal: a 3D soundbar, its first ever. 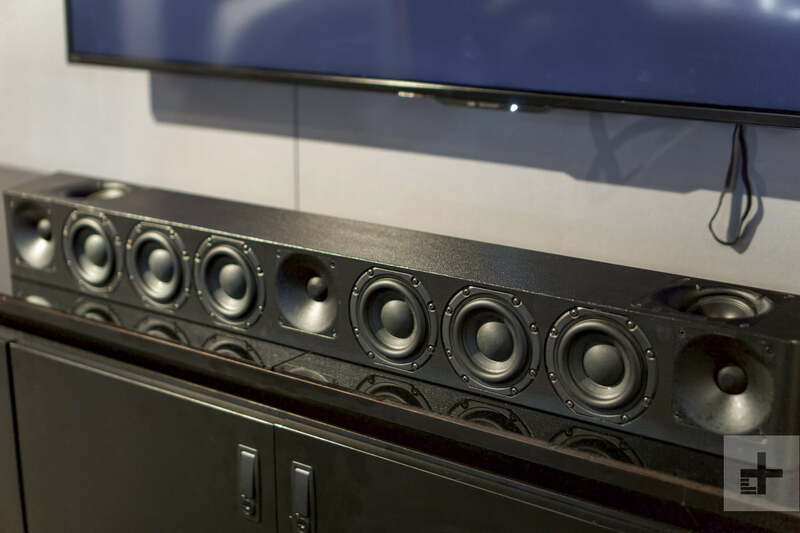 This is no ordinary soundbar, however. 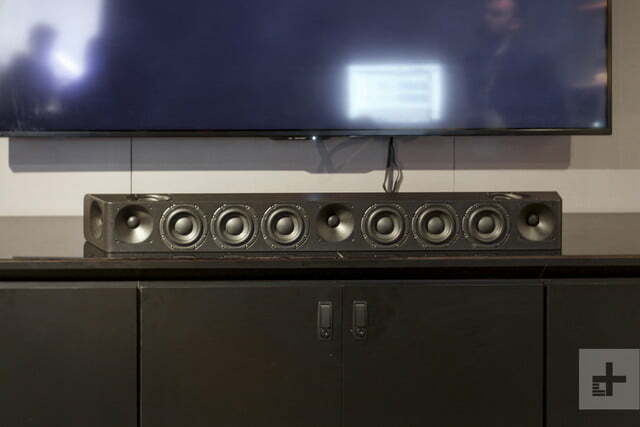 Armed with a suite of drivers developed by Neumann, the renowned professional audio brand Sennheiser acquired in the ’90s, this single strip of sound just might be the best 3D virtual surround soundbar ever created. Sound was rich, smooth, and detailed, handling subtle nuances with a delicate touch, and never became strained or sharp in the upper register. 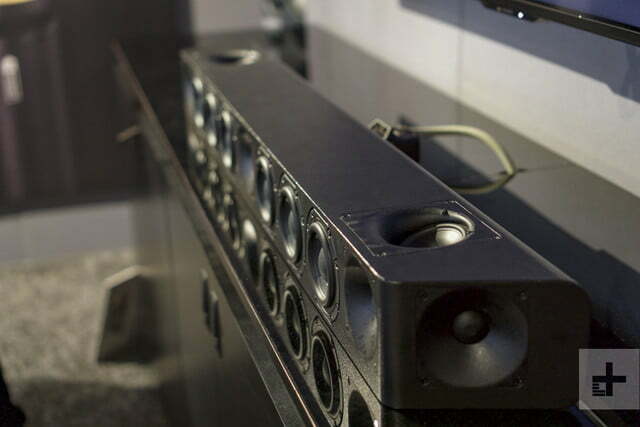 It’s just a prototype now, but the latest to grace Sennheiser’s 3D-audio arm has been thoroughly voiced by the German company’s masters of engineering, and, for now, is known simply as the Ambeo soundbar. Within its sleek cabinet rest 13 four-inch Neumann drivers, tuned with DSP and calibrated with a Neumann microphone in an effort to faithfully re-create what Sennheiser calls 9.1 surround sound from a single, frontside unit. Competitors like Dolby Atmos — a surround sound format the bar does support — would call this 5.1.4 object-based surround. Sennheiser prefers to call its Ambeo 3D surround configuration 9.1 surround, emphasizing a circular design in the horizontal plane that’s just as well-tuned for music as cinema sound. We were among the first to hear Sennheiser’s 9.1 surround sound configuration (which includes elevated speakers at the front and back) firsthand a couple of years ago in London, where the brand showed off its system while live-mixing a concert by pop star Imogen Heap. To compare the soundbar’s virtual 9.1 surround to the real deal, Sennheiser set up a very similar speaker array as the one we heard in foggy London Town, utilizing nine Neumann Studio monitors, including KH 310s and KH 120s, along with a KH 810 subwoofer. During the demonstration, Sennheiser switched back and forth between its bar and the array of professional studio monitors, and to our surprise, the little soundbar got damn close to matching up with the multi-speaker array. While auditioning the famous Dolby Atmos Leaf demo, sounds swept across the room with stunning realism, reaching up above us, to the left and right, and even behind us. When the demo switched to the full 9.1 array, it was cleaner, more detailed, and included more resonance to the sound coming from behind us. The bar features a trio of HDMI inputs expected to support 4K/60 fps passthrough, Wi-Fi, Bluetooth, digital Optical input, and an analog RCA input. Still, the soundbar actually held up to the speakers with its DSP imagery pretty well, and our ears could easily pinpoint movements from the sides, back, and even above. But perhaps just as impressive was the way the bar continued to hold its own during a music demonstration. Sound was rich, smooth, and detailed, handling subtle nuances with a delicate touch, and, unlike so many virtual surround soundbars we’ve heard, sound never became strained or sharp in the upper register. Instead, instruments fluttered, the soundstage swirled around us, and we just sank into the moment. We only had about five minutes with the Ambeo bar, but that was enough to know it’s something extremely special. When it comes to features, the bar is loaded up, and includes a trio of HDMI inputs expected to support 4K/60 fps video pass-through, alongside Bluetooth and Wi-Fi, as well as digital optical and analog RCA inputs. It also offers a subwoofer output, though Sennheiser says it faithfully gets down to a burly 30Hz one its own, and we were quite satisfied if not entirely overwhelmed by the bass response. In other words, if you have to have some massive rumble, you’ll want to add a sub, but the sound won’t feel naked without it. As mentioned, the bar supports Dolby Atmos, as well as Fraunhofer Society’s new MPEG-H codec, and it’s expected to add DTS:X in the future. 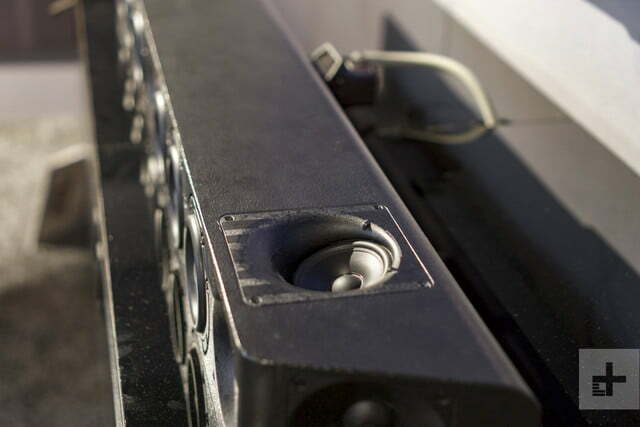 And while a bar loaded with Neumann drivers sounds like it might be expensive as hell to those familiar with the storied audio brand, Sennheiser thinks the bar will be priced to compete with other object-based surround soundbars from the likes of Samsung, LG, Yamaha, and others. We’re not sure when the bar will ship, but Sennheiser is pushing hard to have it out by the end of the year. You can be sure we’ll also be pushing hard to be among the first to give the finalized product a go, so check back with us to find out if the Ambeo soundbar really is the last word in virtual 3D surround.